If you are just beginning to experiment on doing your own manicure and pedicure, creating intricate designs with the use of your favorite nail polish may be a bit of a challenge. Yes, there are plenty of design ideas out there to get inspiration from, but it takes a lot of practice to perfect them. Therefore if you want to give your nails a completely new look right now, try these 5 easy nail designs that are really easy to do with the help of the right nail polishes and accessories. One of my recommended products for achieving these looks is are the O.P.I Nail Polish Gift Sets. Perhaps the easiest way to give your nails a funky look is to coat each nail with a different color. This requires very little effort, only a lot of imagination and several bottles of nail polishes. For instance, you can choose a full blast of bright colors, like yellow, pink, orange, blue, and red. That will surely grab anyone’s attention and this design will really work well with teenage girls. If this seems too young and playful for your age, you can instead try complementing colors, like different shades of red. An easier idea would be to coat four nails with the same color and add a contrasting hue on a single nail. Have you seen nails that look like crocodile skin or those that have swirling patterns? They may seem challenging to do but they are actually easy nail designs. All you need is to equip yourself with effect nail polishes to create that instant magic trick. The swirling pattern, for instance, makes use of magnetic effect, where you hover a magnetic strip on top of your nails after applying the polish. These magnets come in different patterns, so you can create various finishes for every nail. 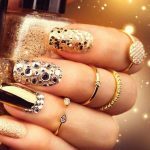 Rhinestone beads are the perfect accessories to your nails, especially if you want to add some glitter for that party that you are going to. These beads come in various colors and sizes to match with your nail polish or with your clothes. They are very easy to attach on your nails too. Just place them on top of a freshly applied coat of polish or use nail glue for a stronger hold. You cannot even draw a straight line, so how are you going to create Hello Kitty faces on your nails? The easiest solution would be to use nail stickers. They are available in fancy patterns and designs. Too many, in fact, that it is impossible not to find something to match your mood or interest. Stripes, dots, hearts, flowers, logos, cartoon characters, and fruits are just some that you may like to try. If you’re a lover of artificial nails, I’ve got you! I’ve written a whole review of gel nails vs acrylic nails, but in this part I’ll be talking acrylics only. These are perfect for those who have short, square, and bitten nails. Acrylic or fake nails already come designed, so all you have to do is choose a pattern you like and glue them on your real nails. If you only want to lengthen your nails, you may prefer to use acrylic nail tips, which also have fancy finishes, like glitters and beads. All of these designs are easy to master, so get experimenting. Get a few friends round and a chilled bottle of vino at the ready for a girls night in, manicure edition. As you can see, easy nail designs need not be boring. You just need to know the right tricks and accessories to use to create seemingly intricate design with the least amount of effort.